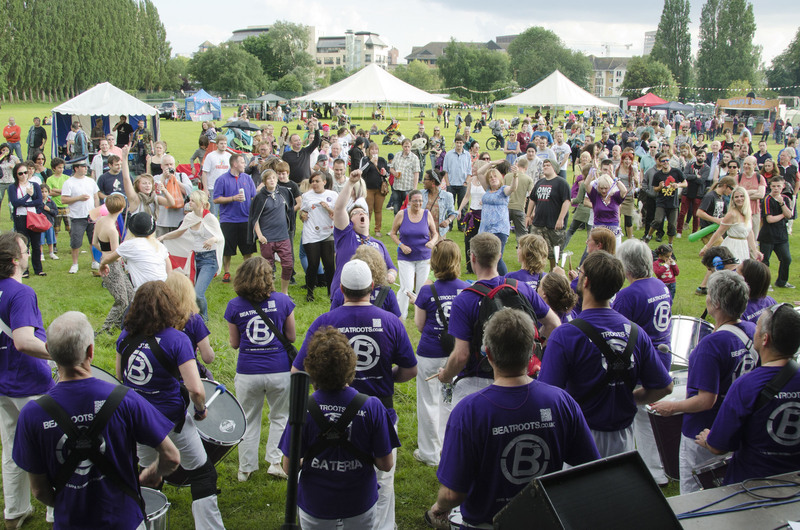 Beatroots Bateria is Reading’s community Samba drumming group. 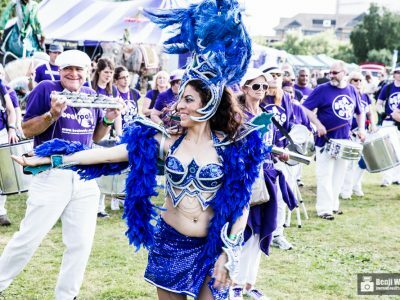 Beatroots plays energetic carnival style samba music mixing African, Asian and Latin-American rhythms and is one of the UK’s longest established community samba groups. The group was started in Reading in 1996 by Readipop founder, Gavin Lombos and is influenced by the Bahian rhythms of Salvador, Brazil. 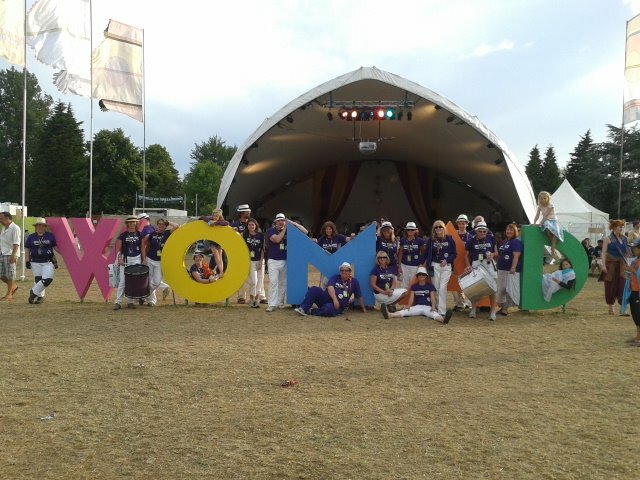 The band has gone on to perform at many major events and festivals including Entertaining the olympic crowds at Eton Dorney during London 2012, London’s millennium celebrations, WOMAD, The Thames Festival and Live Earth at Wembley. Members of the group drummed in the London 2012 Olympic opening ceremony. Anyone can join Beatroots – no experience is necessary! 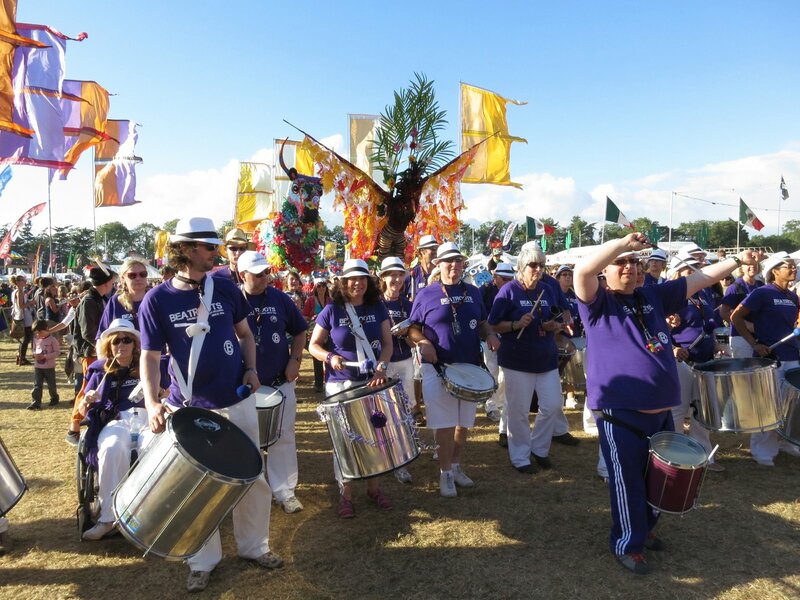 If you want to join the band, come along to the next Samba 101 session where everything will be explained and you can try out the drums and rhythms with full support from the leader and other band members. After that you’ll be welcome at the weekly workshops. If you are an experienced player you can skip Samba101 and join us at one of our weekly workshops. Please e-mail beatrootsmail@me.com before you come along. 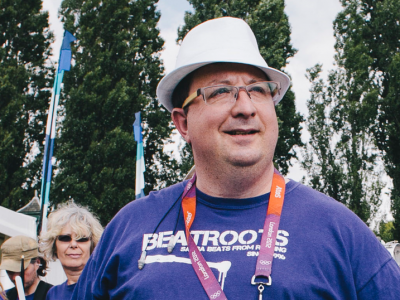 BEATROOTS BATERIA – Samba drumming sessions on Tuesday evenings at Readipop Studios. The weekly workshop sessions normally include rehearsal of the established repertoire and some development of new pieces, depending on whether there is a gig coming up. Please be aware that due to the frequencies and volume of samba instruments we advise you to protect your ears. Pairs of foam earplugs are normally available at the sessions for 50p, alternatively musician’s earplugs are available from us or Drumwright (Hurricane Way, Woodley, Reading) for around £12 (mention beatroots for a discount). Weekly workshops are held at Readipop studios, 35 Milford Road, Reading RG1 8LG (Berkshire, UK) on Tuesday evenings from 8 – 10pm. Click the contact link to see a map. Directions: Head for Caversham and follow the brown signs to Rivermead. At the mini roundabout at the entrance to Rivermead turn into Tessa Road and then first left into Cremyll Road. Follow Cremyll Road round to the right where it becomes Milford Road. Turn right into the yard opposite the junction with Meadow Road. The studio is near the end of the yard, parking is on the right. Standard Rate: Weekly sessions cost £5 for the first 25 sessions – thereafter all remaining sessions that calendar year are FREE! Concessions: Weekly sessions cost £4 for the first 25 sessions – thereafter all remaining sessions that calendar year are FREE! You can pay weekly or for sessions in advance if you prefer. 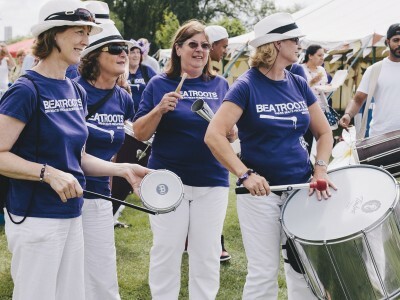 Beatroots’ years normally start in February and end in December with a bit of a summer break in August. Normally there will be about 4o Tuesday sessions per year so if you come to all 40 you save about £75. The weekly fees pay for the venue costs as well as maintaining the instruments. Beatroots earns income from some gigs – this pays for the tutors fees and for new instruments. Sometimes we earn enough from gigs to be able to pay towards band members’ travel expenses. 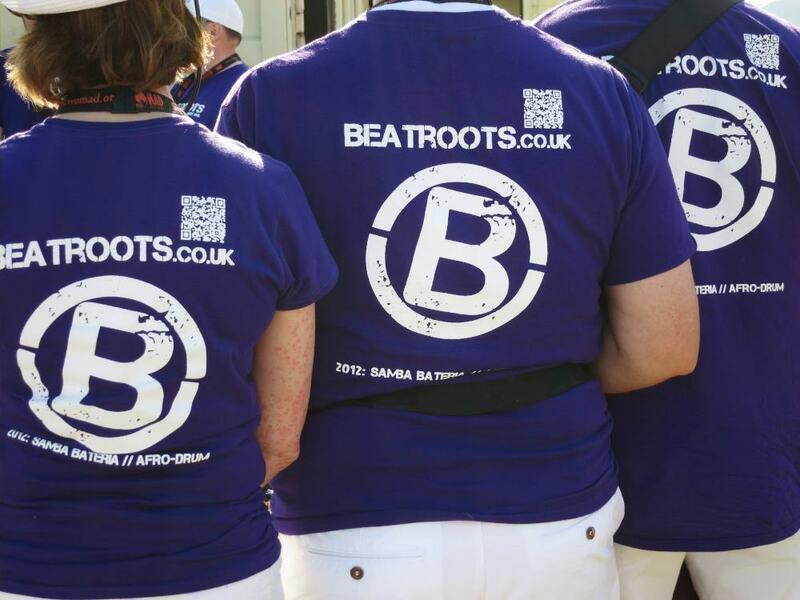 Staying in touch – Band members can subscribe to the Beatroots facebook group in order to keep in touch with upcoming gigs and other information. Just search for Beatroots group on Facebook. * Concessions are students with NUS cards, pensioners, unemployed, and holders of green passport to leisure cards. Proof of entitlement will need to be shown. 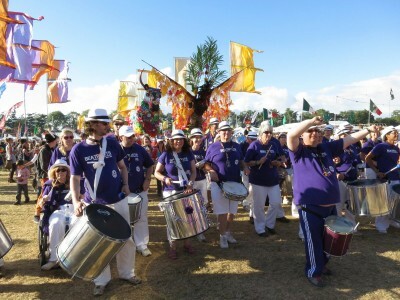 Samba 101 is a beginners workshop and gig based at Readipop Studios, Reading. 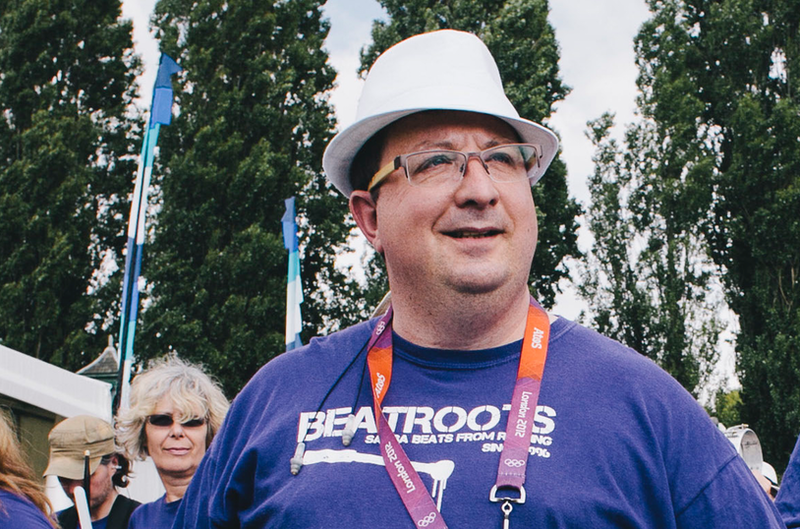 It’s an open event – part introduction to the beatroots style of samba drumming, part workshop, part gig, part party! 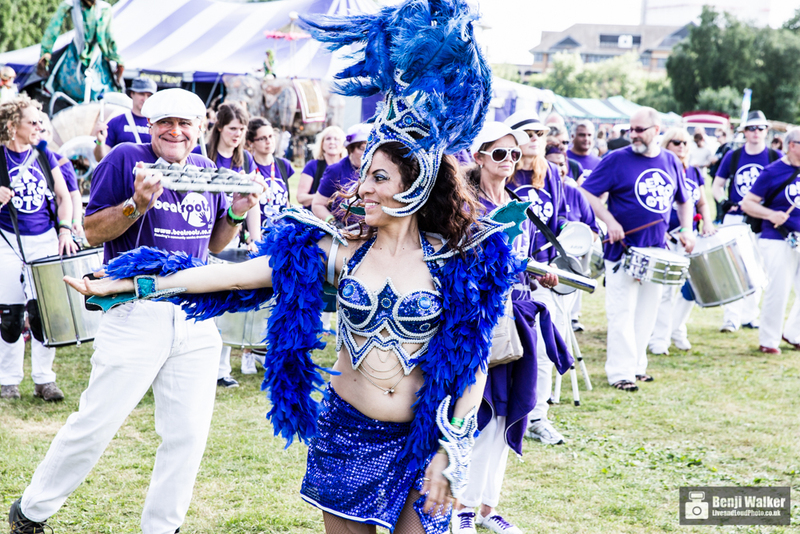 Some groups would call it an ‘encontro’ – we call it samba 101. This is your chance to come along and have a go and become part of the band. As with all our sessions, all the drums are provided and experienced tutors will have you drumming in no time. This workshop is suitable for complete beginners, rusty drummers and those that just want a new challenge. 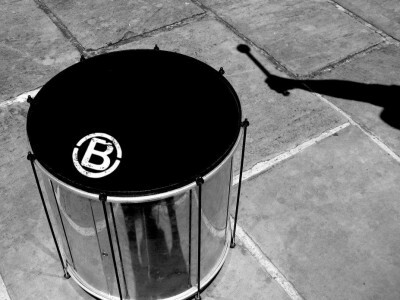 The workshop part will act as a complete introduction to playing in a samba ‘bateria’ and act as induction to the band. Newcomers are always welcome, no drumming or musical experience is necessary, and all instruments are provided. We firmly believe that the best way to learn is to do, so from your very first visit you will be playing along with the rest of the band. The tutors will keep an eye (and ear) on you and the other people in your section will always help out if things aren’t clear. Mistakes are how we learn so don’t worry if you don’t seem to get it first time! Samba 101 features an informal beatroots performance. Workshop participants can join in for part of the gig for the full beatroots experience. We have run workshops in many and secondary schools and can put together a plan that can fit with the school curriculum or work around a school event such as an ‘art week’ or enrichment programme. All School workshops are devised in conjunction with school and are run by experienced CRB/DBS checked tutors. Primary school sessions can involve ‘make and play’, junk instrument workshops or sessions leading up to a procession in the school. Secondary school workshops can explore samba rhythms in more depth, develop improvisation or kick start a school drumming group. £200/half day or £380/day to provide an experienced tutor plus assistant and samba drums for groups of up to 40 students. We will also supply earplugs as required. For smaller groups (under 20) or shorter sessions we may be able to offer a discount. Each workshop is different so call Gavin on 07714 758412 to discuss your requirements. FESTIVALS & EVENTS – Come rain or shine! 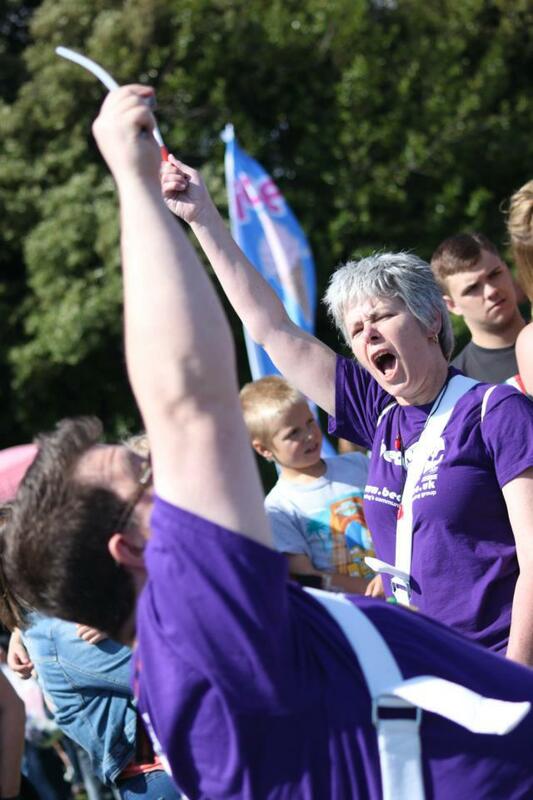 We can devise bespoke performances suitable for most types of events. We don’t need a stage, we don’t need electricity, we don’t even mind a bit of rain! 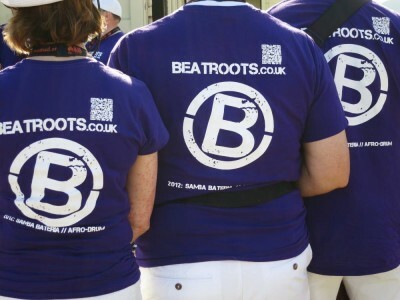 Beatroots has grown into a large band and as such, is ideal for special public events playing outdoors or on the street. The full drumming bateria involves lots of people so needs plenty of notice for new events. The band has performed indoors and outdoors, in the sun and in the snow, in shopping malls, at a motorway service station, on the roof of the National Theatre and under Waterloo bridge. 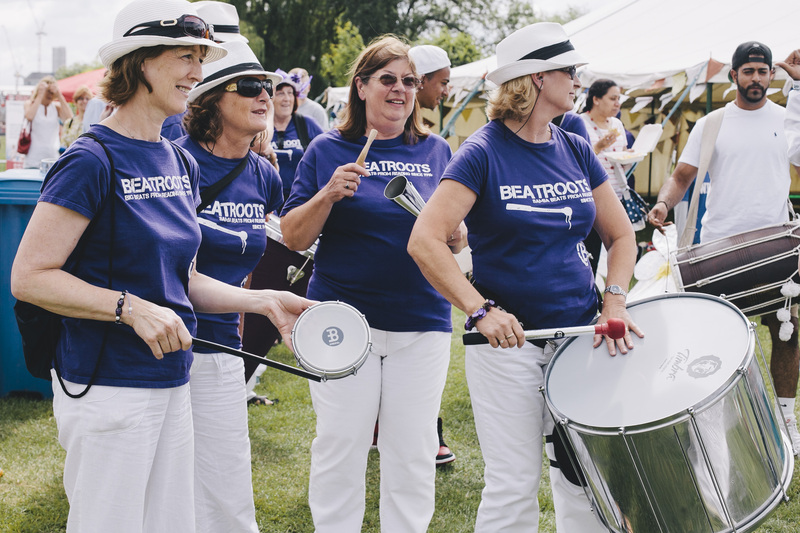 Beatroots can run a special workshop alongside the full band playing in a procession or leading up to a performance on a stage. We have delivered successful junk instrument workshops for WOMAD for over 10 years including the Beatroots ‘Junk Funk’ workshops and childrens procession at the annual Reading WOMAD as well as workshops for WOMAD in Las Palmas, Caceres, Palermo and Athens. These workshops can complement a festival performance and can add extra colour and a family friendly element to a carnival parade. 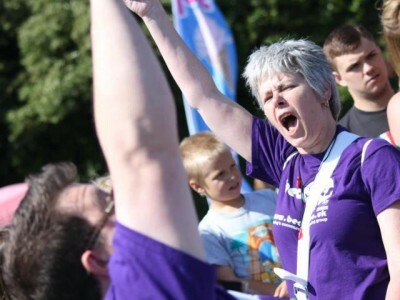 Beatroots has contributed to a wide range of corporate team building activities. We’ve drummed with many work groups from motivating petroleum engineers, energising software support specialists or team-building with 150 bank managers and raising the roof at Coventry football stadium! We even had an indoor carnival at a computer company HQ with dancers and stilt-walkers! 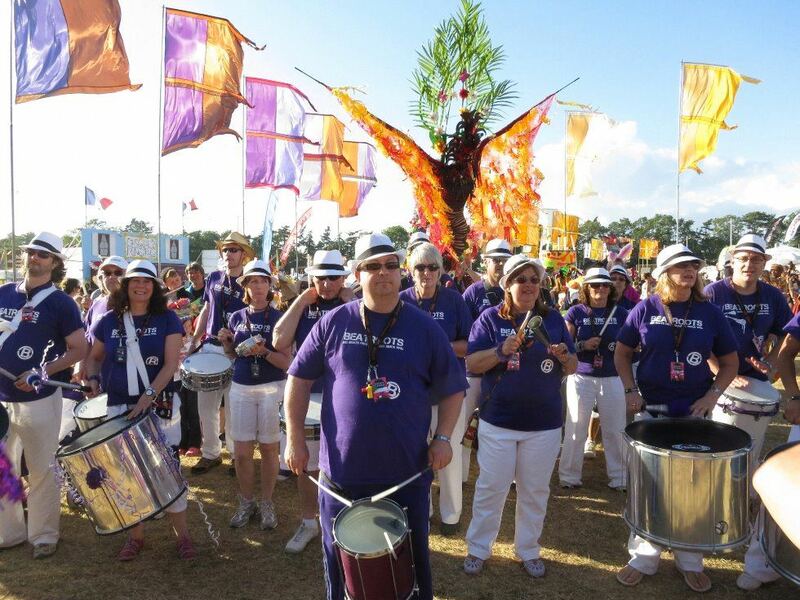 Samba is great for large scale team building sessions as it provides a fun way for teams to work together quickly to create an impressive sounding performance. 1. A demonstration of the rhythms and instruments so that everyone is aware of the overall goal and has the basic knowledge of what we’re all trying to achieve leading to a some fun warm-ups to get the group working ‘in time’ with each other. 2. Our leaders then work with with instrumental sections on their own specialised tasks – ie playing their individual parts. 3. The sections are then brought together by the musical leader who blends the sections and gets the group playing together as one band or ‘bateria’. We learn to start and stop together and add interesting breaks. Please contact us if you want to talk about booking us to play at your event or want to join in!